Apple's dominance of the tablet market is expected to shrink in the next five years as slates from other makers eat into the iPad's market share. Meanwhile, Amazon's Kindle Fire appears to be losing its bloom in the eyes of consumers. Apple, after reaching a market share high of nearly 75 percent in 2013, will see its share decline steadily to 50.9 percent in 2017, according to forecasts by the NPD Group. That declining share, however, will be of a vastly larger market. 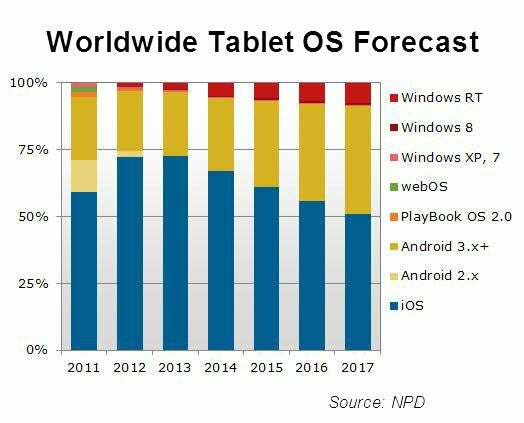 NPD predicts that tablet shipments will increase fivefold in the next quinquennium, to 424.9 million units from 81.6 million in 2011. Most of Apple's declining market share will be grabbed by Android tablets, which will increase its market share to 40.5 percent from an estimated 22.5 percent in 2012, NPD says. It adds that Windows RT slates may be at 7.5 percent of the market in 2017. “So far in this relatively young product category, the tablet PC market has been dominated by Apple and has tended to include a number of competing products that are similarly configured to the iPad," says NPD Senior Analyst Richard Shim. "However, as the market matures and competitors become better attuned to consumer preferences and find opportunities to break new ground, we expect the landscape to change dramatically, giving consumers more choices, which will drive demand for more devices," Shim adds. NPD also notes that the popularity of tablets will attract more investment into the slate supply chain. That, in turn, will spur innovations that will challenge the market position of the existing players. Almost a third (30 percent) of the tablets in the market in 2017 will have AMOLED displays, according to NPD. Meanwhile, tablet sales during the quarter that ended in March suffered, predictably, from a holiday season hangover. Global shipments of tablets declined 38.4 percent during the frame, to 17.4 million from 28.2 million in the holiday quarter, although shipments grew 120 percent when compared to the March quarter in 2011, according to IDC. A big loser during the period was Amazon. Its Kindle Fire, which became the second most popular tablet during the holiday season, saw its market share shrivel to four percent from 16.8 percent during the holiday quarter. While global shipments declined, IDC notes, Apple managed to increase its share of the overall market to 68 percent from 54.7 percent in the December frame. "Apple reasserted its dominance in the market this quarter, driving huge shipment totals at a time when all but a few Android vendors saw their numbers drop precipitously after posting big gains during the holiday buying season," Tom Mainelli, IDC's research director for Mobile Connected Devices says in a statement. "Apple's move to position the iPad as an all-purpose tablet, instead of just a content consumption device, is resonating with consumers as well as educational and commercial buyers," he adds. "And its decision to keep a lower-priced iPad 2 in the market after it launched the new iPad in March seems to be paying off as well." IDC predicts the tablet market will quickly recover from its holiday hangover as new products begin to enter the market this year. "It seems some of the mainstream Android vendors are finally beginning to grasp a fact that Amazon, B&N and Pandigital figured out early on: Namely, to compete in the media tablet market with Apple, they must offer their products at notably lower price points," Mainelli observes. "We expect a new, larger-screened device from Amazon at a typically aggressive price point, and Google will enter the market with an inexpensive, co-branded ASUS tablet designed to compete directly on price with Amazon's Kindle Fire," he adds. "The search giant's new tablet will run a pure version of Android, whereas the Fire runs Amazon's own forked version of the OS that cuts Google out of the picture."